The team began our first morning of filming at 8 a.m.—a feat for our family since we’re almost always running behind! We were amazed to find a crew of wonderful folks waiting for us at the entrance to the park. There was Mitch and Nick, two great guys from the ad agency who would become our interviewers, shirt lenders, and honorary Sherpas for the weekend. Photographer Erin Little, the talented woman behind the lifestyle blog, Bluebird Baby, and her partner Mark snapped pictures of us throughout the shoot. The crew also included camera man Jayson Lobozzo. Jayson was especially kind to CP#2, who wasn’t in the mood for filming on Day 1, but brightened after Jayson shared his personal camera with him. Ramsey Tripp, who is known for his work on The Peloton Project with Patrick Dempsey, was also on hand for filming. Tom, who managed sound, followed us everywhere in the heat with heavy equipment (thank you). And we were thankful for producers Darlene, Victoria and Rebecca, who made sure we had enough water and snacks to keep us energized for the next 8 hours. Filming for the project was a blast. MP wishes she brought her own camera along to document the days. She spent most of the first morning sitting on a piece of driftwood in the sun, answering questions about the great state of Maine, while the kids and DP played on the rocks. Later, we went to The Harraseeket Lunch & Lobster, one of our favorite summertime spots, and ate lunch during filming. We were surprised to find a small crowd of people gathered nearby, wondering aloud, “Who the heck are they?” The crew—cameras nearing our faces (and our lobster rolls)—would joke and say, “act natural!” which sent us all into fits of laughter. We continued to more wonderful places: Mainely Custard, a homemade custard stand in Freeport, and then on to Bath where we strolled Main Street, watched Shakespeare in the Park, and traveled by trolley to the Maine Maritime Museum. Our time at the museum was a highlight for all of us—we loved touring the historic schooner on the museum grounds and would highly recommend a visit. It’s the perfect place for kids to pretend they’re ship captains or pirates at sea. Day 2 had us exploring Popham Beach in Phippsburg, which has to be one of Maine’s most beautiful spots. There’s a great expanse of beach, tide pools, and rocks to climb. The weather was incredible that day—sunny, blue skies, and a slight sea breeze. We played in the water, answered a few more questions, and filmed, filmed, filmed. Compared to Day 1, the visit to the beach was relaxed and easy, mostly because we stayed in one place. When it came time to move on to our next destination, we were sorry to leave. Fortunately, Fort Popham is close by and fun to explore with kids. We played hide and seek in its great stone halls, and poked our heads out the windows to take in the view. Photo courtesy of Tangled & Warped blog. 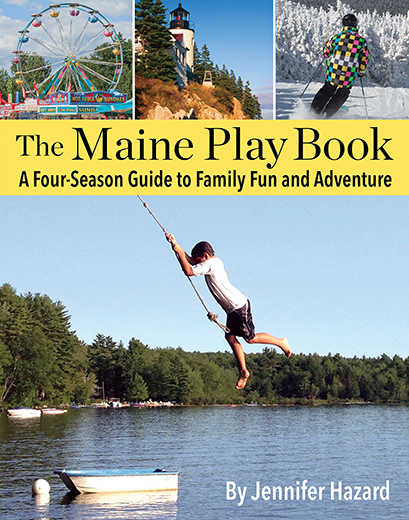 Many thanks to Carolann Ouelette and the Maine Department of Tourism for the opportunity! Great video. Certainly my favorite area of Maine. Please stop by the resort and say hello when you come back this summer. Thanks for the kind note, Bob. See you in the summer!